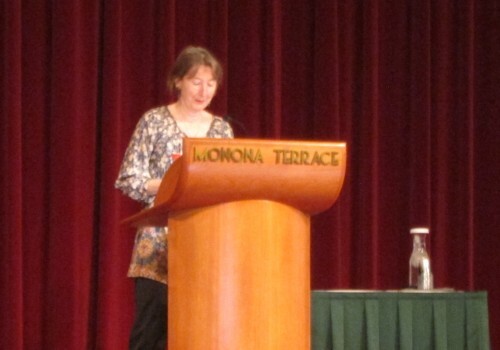 The conference began on a spectacular day on the shores of Lake Monona in the beautifully restored Frank Lloyd Wright Monona Terrace Conference Center with breakfast (including a full plate of Vermont cheeses to sample on each table), and the Keynote speech by Odessa Piper who ran L’Etoile, a farm-to-table restaurant before anyone knew what that meant. While I enjoyed some Vermont Butter and Cheese Co. cultured butter on a croissant, there were two other Guild members happily refilling the cracker baskets on our tables. In addition there as a shout-out to Eliot Coleman for being a pioneer who has helped filled in the winter season local food choices in the northern climates. 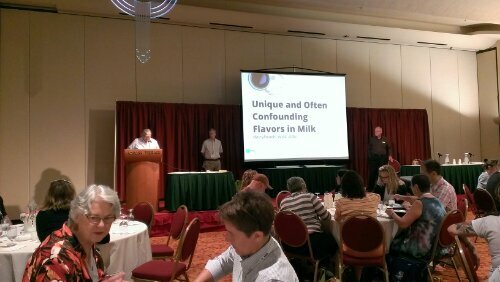 After a short lecture on the typical off-flavors found in milk and their source, each table began to taste 12 different milk samples, followed by one cottage cheese and one butter (both of which exhibited a “grassy” flavor that could be considered by some as positive. 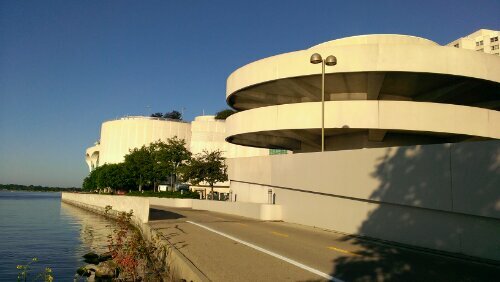 The other off-flavor notes intended to be found in the samples were: plain (neutral) sunlight oxidized, flat (watery), salty, acid, malty (caused by Lactobacillus lactis ssp. maltigenes), chlorine, “baby breath/vomit”, old milk powder flavor, and metal oxidized. 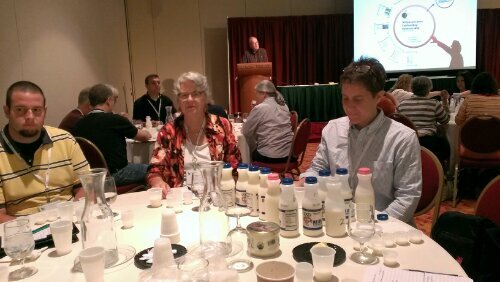 Some flavors were more distinct than others, and it was interesting to taste flights of different milk samples while spitting them all out (since you can change your taste perceptions as your digestive system begins to feel satiated, according to the professors). 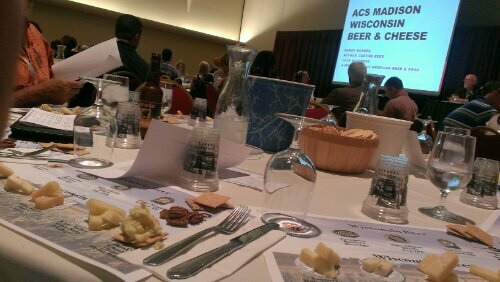 During the business meeting at lunch we learned that there are over 1000 conference attendees this year, and a record 1794 different cheeses entered into the competition (results will be announced on Friday afternoon). 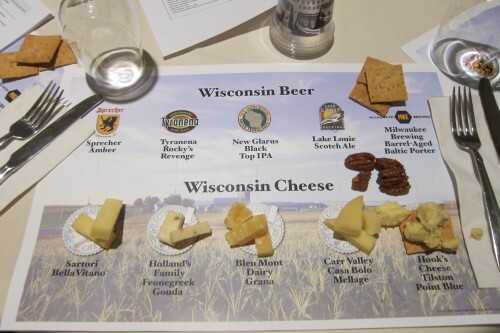 The board member following the FDA review of cheese food safety issues announced that the FDA would launch a second round of surprise visits to artisan cheese makers to test for Listeria, with a special focus on the 24% who tested positive in the first round. They may take action against any cheese maker who tests positive again after an initial positive result. 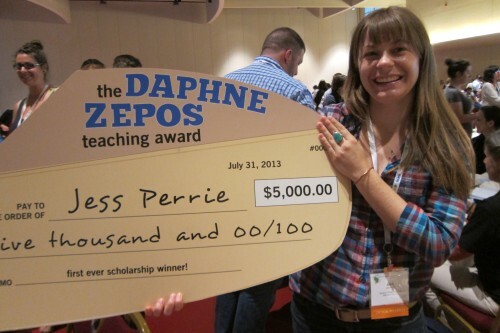 Also, during the lunch time business meeting, the winner of the first annual Daphne Zepos Teaching Award was announced, and it turns out she has roots in Maine: the very first person that winner Jess Perrie (currently a sales representative for Beehive Cheese in Uintah, UT) worked for was Jennifer Bettancourt, who was Guild President from 2006 to 2009, and who was the founder of Silvery Moon Creamery in Westbrook, ME. 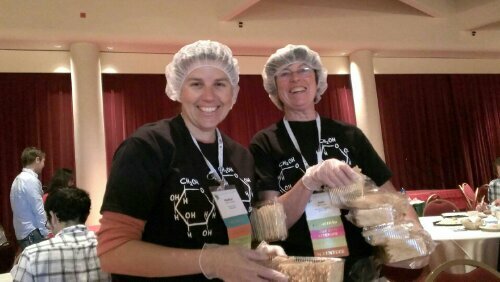 “Jennifer is the reason I’m in cheese,” Jess told me. After graduating from Bates College Jess went to work at Silvery Moon and began her cheese journey. Now she has been awarded $5000 to learn about the connection between cheeses in the Basque regions of France and Spain, and the Basque immigrants who came to Mountain West region of the US long ago to work as shepherds. 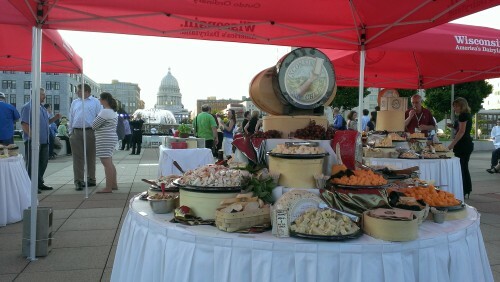 The Wisconsin Milk Marketing Board hosted the ACS conference attendees on the roof of the Monona Terrace Convention Center. 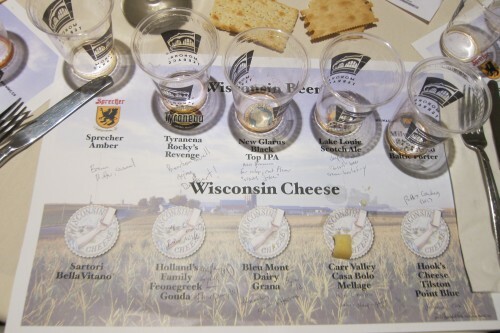 There was beer, cheese, and even mini-bratwurst,a contingent of the Badger Marching Band played “On Wisconsin”, and then a live country band took over. 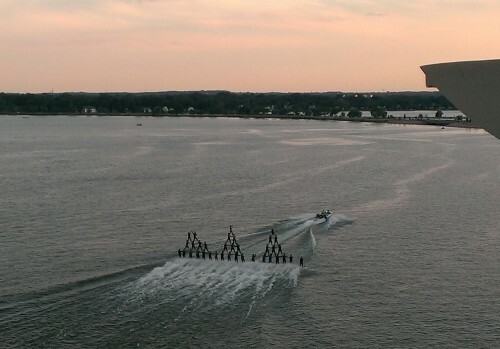 We had a beautiful view back to the State Capitol building, back lit by the summer sunset, as well as all of Lake Monona, and as luck would have it the Mad City Ski Team was putting on a show.